Lately I've been complaining about how I don't have enough skirts, so Friday night I took some of my patterns, went to Joann's and bought fabric to make 3 skirts. 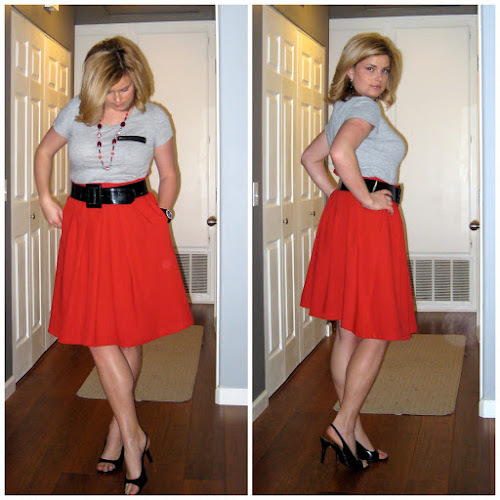 Yesterday I made this red, linen high-waisted skirt. It cost me about $12. It of course has pockets because I love them. I am trying to bring some more color into my wardrobe, so I bought fabric to make yellow and blue skirts as well. I am not 100% happy with how it turned out, but I never am. Oh well. Nathan bought me these shoes our second Christmas together. They are Nine West peep-toe, sling-back, black leather pumps--that's a lot of details. The gray zipper pocket t-shirt is F21. My earrings were bridesmaid earrings from my sister Summer's wedding. The belt is Target. My necklace is from the LA Fashion District and my watch is Fossil. A gift from Nathan. I think I have a skirt pattern similar to that one. Does yours have pleats in the front and back? I made my skirt with some lightweight jean fabric and was afraid it'd be too stiff and I'd look like a circus tent, but it actually turned out pretty cute. I love this skirt. Actually I am a fan of the entire outfit. I am always jealous of great handmade skirts I see blog ladies wearing.